Can ABC Do Justice To Sawyer's Mind-Bending Novel? The new ABC drama Flash Forward is picking up the first members of its cast. And it sounds more and more as though the show, based on a novel by Robert J. Sawyer about a worldwide prophetic blackout, will be a worthy companion in weirdness to ABC's Lost and Life On Mars. 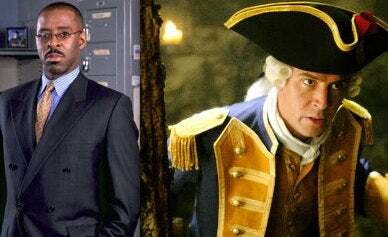 Courtney B. Vance (Law & Order) and Jack Davenport (Swingtown, Pirates of the Caribbean) are both going to star in the new scifi thriller. Sawyer's novel chronicles the madness that begins after the entire population blacks out for two minutes and 17 seconds, during which they all have a vision of the future that launches the world into chaos. Davenport will play Lloyd Simcoe, a man trapped in Northern California, who needs to reach his son in the hospital when the black outs occur. Vance is Stan Wedeck the LA bureau chief of the FBI. It should be interesting to see how many more quirky science fictional shows they can fit on ABC. I'm already happy with Life On Mars and Lost. But I'm hoping they treat Flash Forward better than Pushing Daisies.